Sometimes I joke that everything I own was once someone's garbage. It's mostly true. I love confessing that most of my furnishings were castoffs, much of it from yard sales. The first reaction is usually shock. Then people want to know my secrets for getting the good stuff. Consistently finding the good stuff at yard sales is a mission. Like any mission, it requires strategy. Consider this your garage sale basic training guide. You'll learn how to choose your target, plan your attack, assemble the necessary gear, and get in and out fast. If you’re shopping for vintage furnishings and decor, choose an older neighborhood with older residents. Ideally, they should both be old enough to have enjoyed your favorite period the first-time around. Neighborhoods with basements and attics are particularly promising, especially if you enjoy vintage goods. Homeowners with lots of storage space frequently stash their old stuff instead of tossing it to make room for new goods. If you're shopping for children's furniture new enough to meet modern safety standards, target a newer subdivision with lots of young families. And, keep a list of recent recalls in your flea market tool kit. New subdivisions with upper-middle-class and larger homes are sometimes good sources of newish furniture of good quality. People who like new houses frequently also like new furniture, and those in upscale areas may have more funds for redecorating. Now that you've targeted an area of town, you need to figure out how to hit as many yard sales as possible in the shortest amount of time -- and how to get there before everyone else does. You have to map your route. Today's tech-savvy shoppers find garage sales and map shopping routes using GPS and one of the numerous garage sale sites and/or apps to hit the market in recent years. They no longer pour over paper maps and newspaper pages. Choose one that aggregates from both Craigslist and site-submitted listings, or just from Craigslist. Limiting yourself to the site's submitted listings alone means you're missing out on lots of great sales. If your site or app does the routing for you, make sure you can add sales it didn't suggest. Some folks still prefer to advertise their sales in the newspaper classifieds. You need to check them and add any new sales to your route. Make sure you can change the order of the stops on your yard sale route. The geographic order may be the most efficient, but it's not always the most effective. Sellers have different starting times, and you'll want to prioritize particularly promising events, such as church, multi-family, and block sales -- even if it means driving a few extra miles. Grab the classified section of your local paper or visit the online version. You'll find the most complete listings on the actual morning of the sales, but you may be able to view the next day's listings online the night before. Find the listings for your targeted area of town. Some papers do this for you, grouping them by zip code or neighborhood. If not, note the yard sales you want to attend, along with their starting times. Put a star next to the ones that sound particularly promising, such as group and neighborhood sales, as well as ads that actually list items on your wish list. If you're working from online listings, copy and paste them into a list and boldface or highlight the ones that sound the best. Repeat Steps 1 and 2 with Craigslist. You can find city maps online and print just the neighborhoods you need. Keep a stack handy for each of your usual target neighborhoods. Each weekend, mark your chosen sale locations on the map and write the starting time next to each mark. If you starred the sale, note that on the map too. Use a highlighter to trace your route on the map, starting with all the sales that begin at 6 a.m., then 7 a.m., and so on. Make sure your starred locations are your first stops on the route for their specific starting times. If you're not too tech-phobic, get precise directions by entering your stops on your GPS or your smart phone's driving directions app. It may seem like a lot of prep work, but it's worth it. You'll be zipping from sale to sale while other shoppers are still trying to figure out their next stops. Carry lots of ones so you don't lose time waiting for the seller to make change. <>Stash different denominations in different pockets. Make sure you can pull out one bill at a time if needed. Nobody needs to know how much money you're carrying. And, if you've just haggled down the price, you don't want to pull out a fat roll of bills when you pay. Bubble wrap or newspaper to get breakables home intact. Large mesh tote bag or lightweight folding laundry cart on wheels, especially for larger sales, to keep your hands free while you shop. The rest of your flea market and yard sale tool kit. It's time to move out and engage -- which means it's finally time to shop. As you enter each sale, make a quick visual scan. You don't want to waste time looking at the bits on the tables while someone else buys the perfect chair for your living room. If you see something you think you want, pick it up and carry it with you. If it's too big for that, take the cushion, the drawer, or whatever portable part makes it unusable to someone else -- and marks it as yours. If you're positive you're buying an item too big to carry, especially at a large or hectic sale, go ahead and pay for it. Then, slap a sold tag on it so you can finish shopping in peace. If you buy something too big to take with you, tell the seller who will pick it up and when. Use your notepad to write a simple receipt and ask the seller to sign it. Write down the seller's address and ask for a phone number. Put a sold tag on your purchase. Put your phone number on the sold tag in case the seller needs to reach you. Don't be afraid to haggle. Offer a little less than you're actually willing to pay, or offer a group price for several items. Sellers are less willing to haggle early in the morning, but if you're willing to risk the piece selling to someone else, you can always check back later in the day. Make fast decisions. Don't spend all morning trying to decide if you really like something or not. Remember your mission. Get in and out fast, and then move on to the next sale. 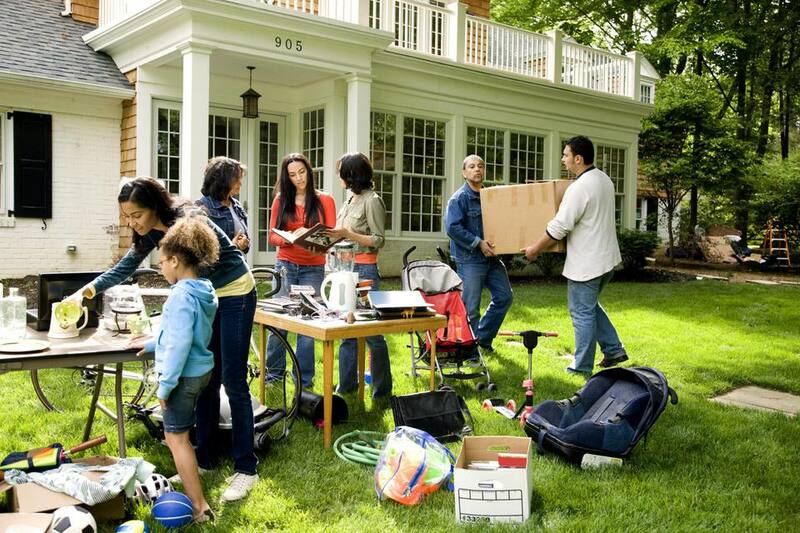 Garage Sales, Yard Sales, Tag Sales: What's the Difference?